This morning one of my tweeps, Joji Philip Thomas @jojiphilip on Twitter, tweeted the two photos above saying that a car in front of him had just exploded. 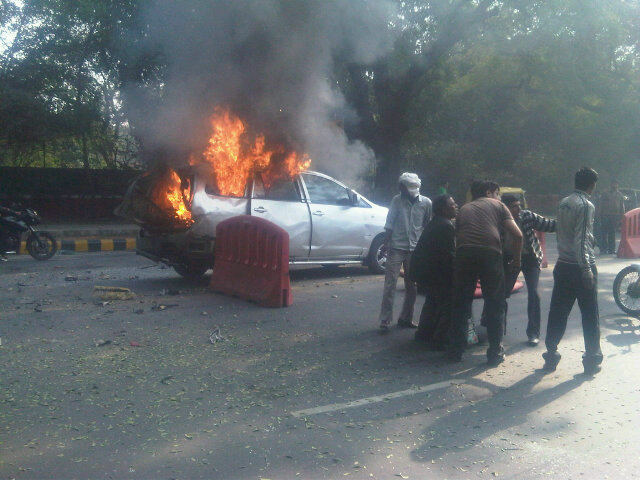 A newsman himself, Joji was on Aurangzeb Road, in the diplomatic enclave of New Delhi.”The car in front of me just exploded – a foreigner inside got flung to the other side of d road,” read his sensational sounding tweet. The Israeli lady who was inside the car & was badly injured insisted that she be taken to the embassy,not hospital went another tweet. And shortly thereafter: hey, all u news channels who are using my photographs of the blast of the #Israeli diplomat’s car.how come no credit for the photos??? Since then the Agence France-Presse has tried to buy the photos from Joji who himself works for The Economic Times of India. In the meantime according to @yaakovkatz: Reports of explosions near Israeli embassies in India and Georgia. Come day after 4th anniversary of Hezbollah military chief assassination. It’s now confirmed that a man on a motorbike rode up behind the Israeli Embassy vehicle and attached a small, sophisticated bomb to it. 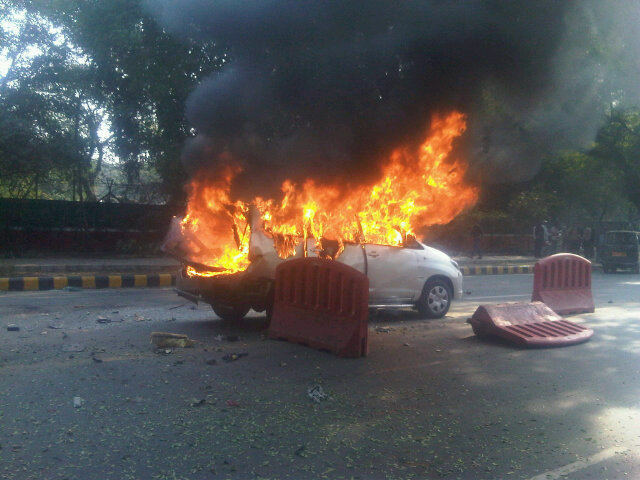 Acccording to @geevishnu A biker planted a sticky bomb on the rear of innova and fled the scene. The lady who survived is a diplomat. So is her husband. Meanwhile the Israelis have announced that Iran is behind the bombings in Delhi and Georgia. According to newswoman @suhasinih: Car explosion: Israeli govt confirming 4 attacks planned : Delhi+Tblisi explosives;3 arrested in Baku, Threat foiled in Bangkok. Not everyone agrees. Tweeted the editor of Newsweek International Tunku Varadarajan known on Twitter as @tunkuv: My instinct: Iran can’t be behind Delhi bombing of Israelis. Why wd Iran sow terror in the one major US ally that is buying Iranian oil?” Indian authorities have also said that it’s too early to determine who was behind the bombings. According to the Washington Post the injured woman is the wife of Israel’s defense attache. Their article has a lot more details on the bombing in Delhi and the foiled attempt in Tbilisi where a grenade was found attached to the car used by the Israeli ambassador, Yitzhak Gerberg. I wonder if this is not also a response to the deaths of Iranian scientists? We’re seeing “dirty war” being waged all over the world. Kingston may not be spared. Of course, it could also be a pretext for the Israelis to strike at Iran. What do I know?